Pruitt says the change would increase transparency in the agency's decision-making by requiring all underlying data used in scientific studies to be made publicly available. Critics, including former EPA administrators and scientists, say Pruitt's move is designed to restrict the agency from citing peer-reviewed public-health studies that use patient medical records required to be kept confidential under patient privacy laws. 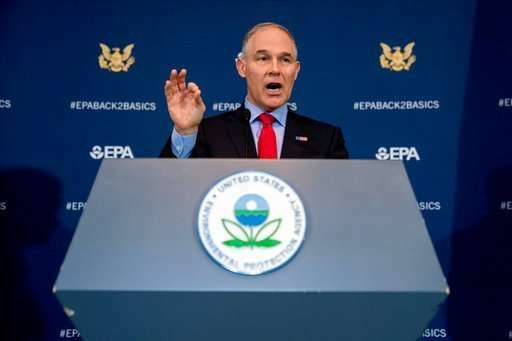 The embattled EPA administrator signed the proposed order at EPA headquarters Tuesday in an event that was livestreamed on the agency's website but not open to press coverage. Only in the USA is incompetence and anti-science religious narrowmindedness applauded and raised to the highest offices. Only in the USA would an anti-science troll run a scientific organisation. Hang your head in shame, America: you're the laughing stock of the scientific world. This "Character" needs an independent full out Audit and everything he's touched must be looked at. How much ill gotten booty does he have stashed and where is it coming from ? His soundproof call booth (The Cone of Silence) is TELLING as to the secrecy required for him to be undo the EPA and de-evolve the US to pre-1970 status & worse. The EPA should be renamed the Environmental Pollution Agency for as long as Pruitt is its chief.